A few weeks ago my son was over at his little buddy Ty’s house. I went over to get him because it was dinnertime. Ty’s mom and my good friend Melody ended up sending me home with 2 pieces of stuffed french toast! It was soooo good! 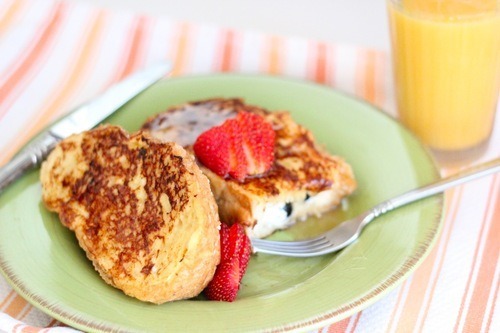 So for Father’s Day I decided to come up with my own version of stuffed french toast. Kimble loved it and used the term “off the charts good!” We have a winner folks! And it’s oh so easy! Boil for 1 minute then remove from heat. Using small sharp knife cut a pocket in center of each slice, making sure not to slice all the way through. With a fork fill each french bread pocket with some of the ricotta mixture. Take rinsed and dried fresh blueberries and press 6-8 berries into each pocket. 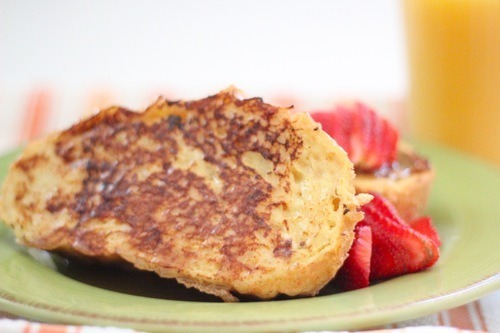 Dredge each side of the french toast through the custard, making sure you don’t let them just sit there. You don’t want them to get so soggy as to affect the filling inside. Then on a medium heat griddle or over medium heat in a saute pan. Use best judgement to doneness. Mine took roughly 2-3 minutes per side. 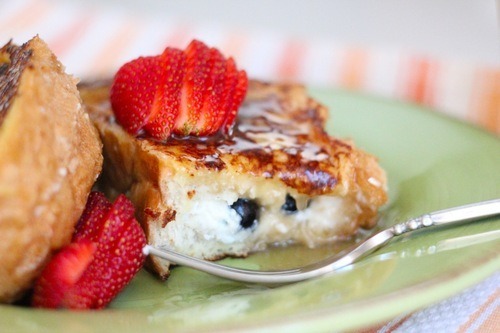 Drizzle with buttermilk syrup and garnish with fresh berries. ENJOY!